Are they more than just a co-worker? No matter where you work, deciphering one-on-one interactions can be tricky. After all, you want to know when a colleague is flirting with you, but you don't want to compromise your professional standing if you misread a signal. Can't decide if you're involved in a normal professional interaction or if you're creating romantic sparks? Here's how to decode flirting at work and read whether your colleague is interested in something more. Due to the professional nature of the workplace, flirting at work tends to be more subtle than in other settings. 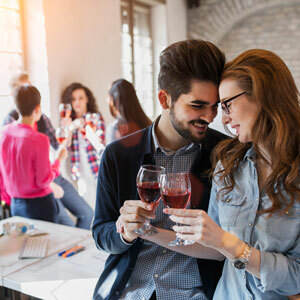 For many people, playful flirting often works best in the office, since it's relatively innocuous while still communicating interest. If your co-worker regularly teases you in a playful way, pay attention to how you react. Gently tease him back and take your verbal exchange to the next level if you want to return the favor. It isn't unusual for co-workers to seek each other out occasionally, especially if the two of you are friendly or if you need to run a work question by her. If she constantly seeks you out to catch up in the office, to socialize at workplace gatherings, or to plan lunches and happy hours, most love psychics would say she's seeking something more. Whether she has a relatively traditional flirting style or she's trying to remain professional, you can reciprocate the attention. Try seeking her out and making excuses to talk with her whenever you can. If you're constantly interacting with your co-worker due to neighboring offices or a joint project, it might not be easy to tell if he's into you or if you're running into each other by coincidence. However, keeping up the communication even when you're not together could indicate he's seriously interested. If he regularly texts you in or out of the office, comments on your social media posts, or hits you up just to say hi on work chat, he's clearly thinking about you. Keep the conversation going and be sure to initiate to let him know you're interested, too. When it comes to flirting, some people are much more physical than others. Even if your colleague doesn't directly touch you, she might hint at it or create intimate space for the two of you. If she regularly shares private information with you, has a habit of whispering in your ear, or finds small ways to touch your arms or back, consider these signs that she's flirting with you, especially if she rarely gets quite as close to the rest of your co-workers. To show your interest, return the touch or encourage the intimate space she creates. You may not be able to read your co-worker's mind, but you can certainly read his or her body language, especially when it comes to flirting. For more insight into what your situation holds, get an authentic psychic reading and decide if you should flirt back or keep it professional.